MASERU – The mines ministry has set out plans to beef up operations and productivity for the financial year 2019/20. This, the ministry revealed in a presentation before parliament last month in a move that requested the approval of an expenditure budget of M42, 080, 269.00. Of the proposed budget, Minister of Mining Keketso Sello revealed that M24,158,469.00 is for the Recurrent Budget, while M17,921,398 is for the Development Budget, while the Revenue Budget estimate was put at M627,916,575.00. Outlining the ministry’s forecast for the year ahead, the minister noted that, among other things, his ministry is looking at improving revenue collection from the sector by putting in place measures that will help maximise collection. Furthermore, the ministry is hoping to speed up the legal framework to accommodate revenue collection from Artisanal and Small-Scale Miners (ASMs), which is a preferential opportunity strictly meant for Basotho. 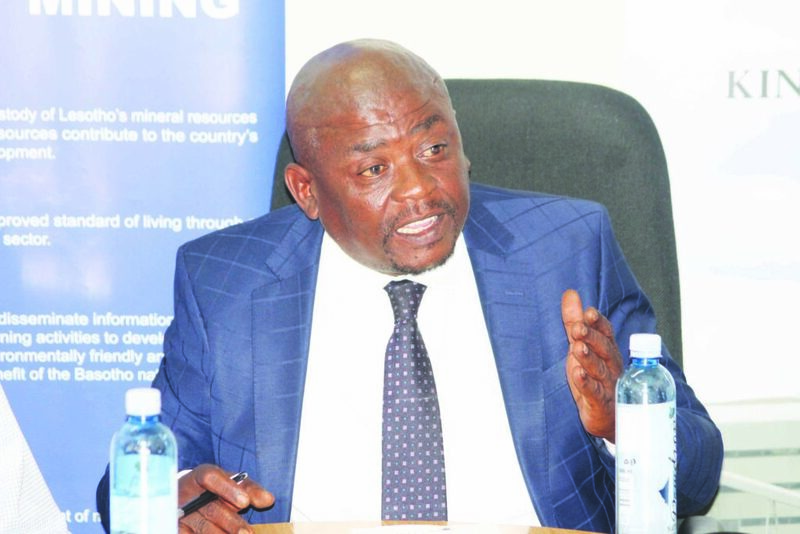 “The Ministry of Mining is committed to develop, regulate and sustain a viable mining industry that promotes sustainable mineral resource exploration and exploitation through creation and provision of a conducive mining environment for the socio-economic advancement of the country,” Sello said in his request before Parliament. The mining sector has in the past been labeled as one of those that are complex and not easy to deal with by the Lesotho Revenue Authority (LRA) in terms of tax collections. While the sector contributed massively in ensuring that the LRA meets the target in 2018/19 financial year, the LRA Commissioner General Thabo Khasipe indicated in an interview with Public Eye that the mining sector performed increasingly well, stating however that they still have to sit down with players in the sector and discuss a way forward. “I am happy with the performance from the mining sector but there are still challenges that need to be addressed in order to improve performance even further,” Khasipe said in an interview with Public Eye last week, shortly after announcing revenue collections for the past financial year. The mining and quarrying industry registered an approximate 123 percent increase in payments in the authority’s income tax collections. The LRA eventually managed to meet its revenue target, collecting M6.9 billion against the target of M6.8 billion which the authority managed to do for the first time in three years. During this presentation, the ministry was further scrutinised by another member of Parliament, Kimetso Mathaba, who emphasized that the ministry is still challenged in terms of assuring the nation that mining companies report fairly on the proceeds from the diamonds that they sell abroad. “Currently the ministry cannot assure this Honourable House of the true value of the diamonds produced in the country and the price that they fetch on the international market,” Mathaba observed. In the current financial year, the ministry will also be focusing on intensifying mineral exploration to determine potential mineral resources and reserves of the country through follow-up exploration programmes on selected target areas.